Chandra Lee April 16, 2013 April 16, 2013 Off Topic, Think about it! It happens every disaster, fake accounts spilling fake news offering either fake deeper despair or fake hope. I don’t know why anyone would want to perpetuate a lie about distressing news or spend time setting up fake accounts but it happens. Anonymous lying or boasting is a strange issue to me. Today was no different, after the horrible bombings in Boston someone set up a fake account with the Twitter handle @PrayforBoston of all names. The account claimed in one tweet that an 8 year old girl that was running the Marathon with a Charity Team for fallen Sandy Hook classmates was killed. The picture above was linked to the tweet saying RT (retweet meaning to repost on Twitter) for respect. 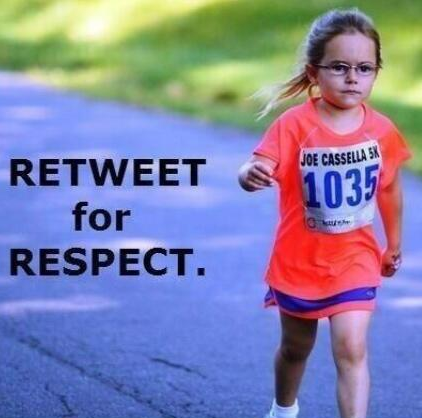 Even though the running tag on the girl’s shirt is not of the Boston Marathon people still bought into it without any real proof or verification from a trusted source. The picture spread all over Twitter and the fake ironic news began to show up on Facebook and other social media platforms. Then there was another tweet from the same account with the exact same circumstances except it was a boy that was the runner. There was a picture of him also. That began to make brows wrinkle because the news had said there was only one 8 year old child that had died not two. Suddenly people began to think perhaps this is not true and low and behold it was not! Then the name calling and verbal abuse began from people who were angry that the account was lying or that it was even made. People already hurt, angry and confused over the terrible event were now lashing out at the Fake Account perpetrators that hid behind @PrayForBoston. Twitter quickly suspended the account, but the picture and fake story are still being shared throughout the internet. There will be more heart wrenching stories some true and I am positive many fake. We need to slow down and figure things out in this case before we repost and fan the flames of these false rumors. Maybe a lack of sudden acceptance will cause the anonymous attention seeking fake account folk to slow down also. Previous That’s My King! – Happy Easter!